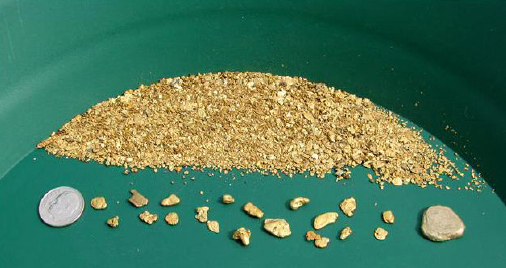 Gold is heavier than most gravel found in streams, so that's why it can be collected in a gold pan when the right techniques are used. Gold can be found in many forms- nuggets, wire, tiny lumps called "pickers" or flat flecks and feather-shaped crystals. Assuming you already own a gold pan(s) and know the location of recreational gold panning sites in a gold-bearing areas, all you need is an optimistic attitude and lots of practice to get good at hand panning. First, look for a "gold trap" - a place along the stream where the current slows down enough for gold to settle. Gold can settle on the downstream sides of boulders and logs or in bends or curves in the stream. Many prospectors time their outings to coincide with winter snow melt or following a big storm. The thought is that Mother Nature may have loosened the gold lodged in high places and now it's flowing downstream and getting stuck in spots where you can reach it. 3. Continue to hold the pan level under the water with your hands on opposite sides, and tilt the pan forward, away from your body, and down slightly. Rotate and shake it side to side to let gravel and sand dribble out the front. Pick out the rocks. 4. Repeat step 3 several times until most of the material is removed, leaving less than a cup of fine-grained dark material overlain with a thin layer of light material at the bottom of your pan. 5. Rotate the pan in a circular motion. Notice how the water separates lighter material from heavier. 6. Stop rotating and hopefully you'll see a flash in the dark material remaining in the bottom of your pan! Use tweezers to retrieve the gold and place in a vial for safe-keeping. Keep in mind that all the shiny stuff in your pan may not be gold. Pyrite, known as "fool's gold," and mica are both brassy in color. If any gold-colored flecks float on the water, it's a sure sign it's NOT real gold. Don't get discouraged. Keep practicing, and sooner or later that flash in your pan will be the real deal! Browse a wide selection of gold pans and gold pan kits here.